Hillary Clinton has a HUGE Tax Problem: Where Is The Media? Hillary Clinton would love to divert people’s attention away from her families extortion racket known as The Clinton Foundation. I dare any Liberal to show me something The crooked Clinton Foundation has done that other charities hadn’t done or could do. The Clinton Foundation is an elaborate money-launder, an influence-peddling front for supposed good deeds of the Clintons and their cronies. And their tax documents verify this. 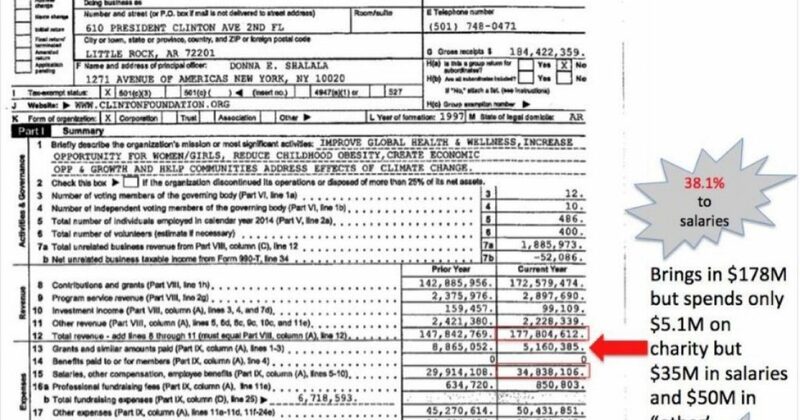 As you can clearly see, The crooked Clinton Foundation brought in $178,000,000. However they only spent $5,100,000 in charitable work. For The crooked Clinton Foundation to donate $5 million, they need to spend SEVEN TIMES that amount on payroll? So only 5.6 percent of their income actually goes to charity, while 38.1 percent goes to salaries? I’d love to know exactly what “other” is, though I don’t expect the IRS to bother to ask. Nor do I expect the agencies who gave the Clinton’s their Grade A Charity rating to bother about that “rounding error” in their financial report. So making a sizable amount of money for doing nothing in 2015 other than trading on their past and their hoped for future in the White House, the Clintons want us to see that they donated $1,042,000 to charity. How nice. Closer inspection reveals all their charitable donations ended up going back to them. Obviously the Clintons are not charitable. Under fire for pay and play corruption, of which the IRS is, of course, ignorant because it’s a Democrat owned and controlled operation, the Clinton Foundation is a way for rich people, Americans or foreigners, to buy influence and favors from the Clintons, especially Hillary. Giving a million bucks to the Clinton Foundation is as ridiculous as it gets in terms of making a charitable donation, but hey, what happened to the $42,000? Did they donate that to a real charity? No. They gave it to Desert Classic Charities, a golf tournament. So, again, the Clintons gave all that money — a “charitable donation” — to themselves. This is tax fraud. They gave 10% of their income to “charity,” wrote that off their taxes, and then these Clinton-owned charities will launder the money back to them. And we paid for that. In addition to writing off $1,042,000 in charitable donations, the Clintons found another $1,358,000 in tax deductions. But because they don’t actually do anything, what are they writing off? How does one get almost a million and a half dollars worth of write-offs from talking to people? Is Hillary Clinton really on the level when she says she is going to make millionaires pay their fair share? Do you really believe she going to mess with the tax system from which she and her husband benefit from so lucratively? What about all the stuff on which Hillary is running for president and claims to care about deeply? Reproductive rights? Black lives? Gun control? Immigrants? In 35 years in politics she hasn’t given a liberal dime to any of those things. Why should we think she will? The Clinton could have helped veterans; they could have funded medical research or aided people with mental illness. Instead, they decided that they themselves were most in need of help and so gave to themselves. A shining example of the Democratic Party’s operation of ruin for the last 60 years, besides ripping off the American people, this shows how little the Clinton’s actually care about Americans. They’re in it for themselves — totally!